Beautifully engraved certificate from the El Paso Corporation. This historic document was printed by the American Banknote Company and has an ornate border around it with a vignette of an allegorical woman holding a globe. This item has the printed signatures of the Company’s Chairman, President and Chief Executive Officer and Corporate Secretary. 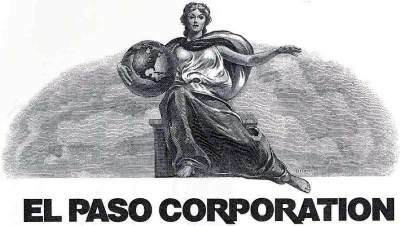 The company, formerly known as El Paso Energy, is primarily engaged the production and marketing of electricity, natural gas, and other commodities. It has interests in global energy projects, including power plants that have a generating capacity of more than 10,000 MW. Operator of the largest gas pipeline system in the US, El Paso owns or has interests in 60,000 miles of pipeline in the US and internationally and has proved reserves of more than 6 trillion cu. ft. of natural gas equivalent. It is also involved in telecommunications bandwidth trading. 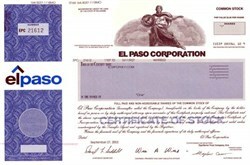 El Paso Corporation is the leading provider of natural gas services and the largest pipeline company in North America. The company has leading positions in natural gas production, gathering and processing, and transmission, as well as liquefied natural gas transport and receiving, petroleum logistics, power generation, and merchant energy services. On September 27, 2002, the shares of the El Paso Corporation, the nation's largest natural gas concern, plunged after an administrative law judge at the Federal Energy Regulatory Commission said the company helped illegally drive energy prices to record highs in California in 2000-2001 by manipulating gas supplies.